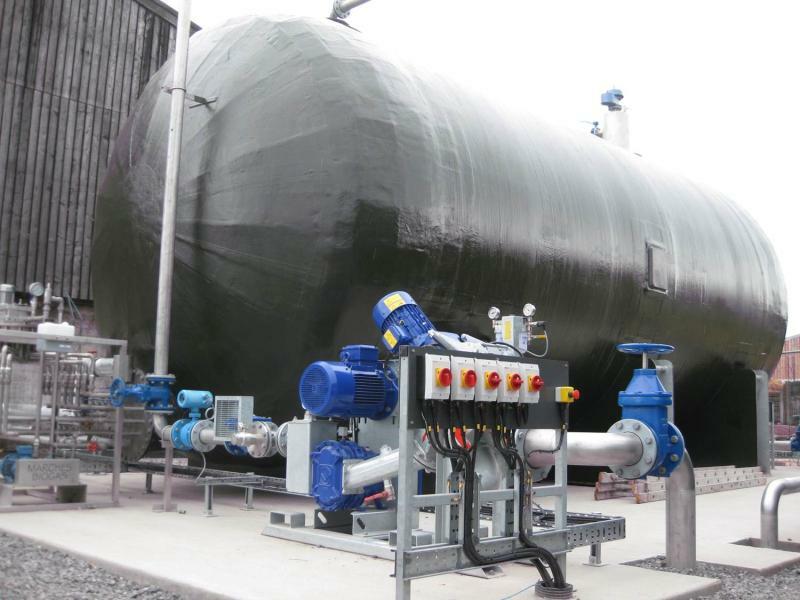 Silotank manufactures a range of GRP tanks for the Anaerobic Digestion process. A wide range of options are available for Hydrolysis and Pasteurisation tanks up to 150m3 withstanding temperatures up to 90°C. These can be fitted with internal heating coils to make the most of excess on-site hot water to assist the pasteurisation process. GRP is a natural insulator which can be paired with extruded polystyrene insulation to ensure maximum efficiency during the hydrolysis or pasteurisation stage. The contents of the tank can be mixed using a top entry agitator or using an external recirculation pump. With the use a conical base, this allows full drainage of the tank. The tanks can be fitted with a variety of level instrumentation – ultrasonic level indicators, thermocouples, pressure transducers etc. GMS access ladders and platform can be provided to allow ease of access to the roof of the tank. Most AD facilities will have a pasteurisation phase to kill harmful pathogens before or after digestion and will normally consist of raising the temperature of the material to 70oC for 1 hour. This is often a requirement for AD plants using any animal by-products or food and household waste as a feedstock. We also manufacture various bunded chemical storage tanks to be used in conjunction with the Anaerobic Digestion process.